Growing to lengths of over 50 feet, the massive adult humpback whale has few natural predators. These marine mammals are found in most of the world’s oceans and undertake extensive annual migrations between their tropical breeding grounds and the colder polar waters where they feed. Researchers estimate there are between 18,000 and 20,000 humpback whales in the northern Pacific Ocean, and around 15,000 in the southern hemisphere migrating between Australia and Antarctica. Transient killer whales prey on marine mammals, and are one of the humpback whale’s main predators. They attack calves and younger animals more frequently, and most humpback whales have scars as a result of prior orca attacks, including drag marks on their tails. Pacific humpbacks breed in the tropical waters around Hawaii, a location researchers presume was chosen because orcas rarely swim in warmer tropical waters. The most aggressive shark species, including great white and tiger sharks, often prey on humpback whales, usually targeting young calves or adults who are sick or otherwise in distress. Great white sharks have been observed off the coast of Australia following humpback whales as they migrate to their breeding grounds, and many adult humpbacks carry the distinctive rake marks of great white teeth along their sides. A shark attack on a humpback is a war of attrition, with the shark continually biting at the whale until it can no longer swim. The whale’s blood in the water attracts more sharks to join the fray. Despite international law prohibiting commercial hunting of whales, humans remain the humpback’s greatest predator and the reason the animals are endangered. Researchers estimate 200,000 southern humpback whales were intentionally killed by commercial operations. In the 20th century, approximately 95 percent of all humpback whales were hunted and killed. The species is still hunted by Japanese whalers in Antarctica. Norway and Iceland have also been cited for engaging in whaling operations in violation of the international moratorium. Most other threats to the humpback whale’s survival also come from human sources. Organic and chemical pollution of the ocean affects the reproductive and immune systems of whales and other marine mammals. Whales rely on hearing and echolocation to navigate their ocean home. Noise pollution from sonar systems and devices searching for offshore oil and natural gas deposits interferes with their navigation, causing them to swim into waters too shallow and close to coasts, leaving them stranded on the shore to die. 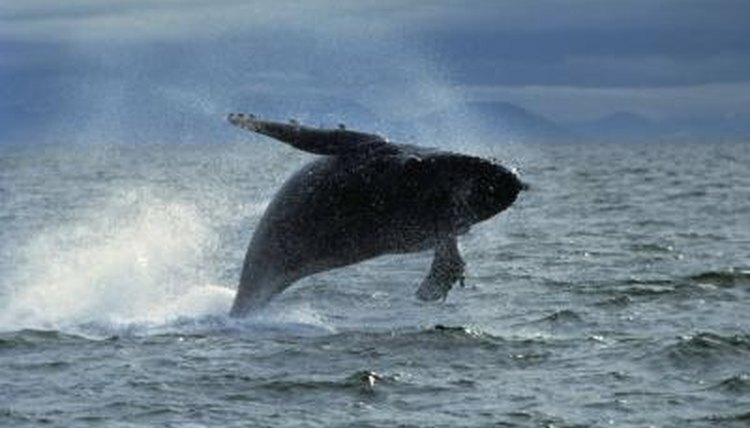 Commercial fishing presents dual hazards: over-fishing limits a humpback whale’s food supply, and whales entangled in cast-off nets will suffocate when they cannot reach the surface to breathe.